How can you say no to that face, man? I feel bad for pretty much every character on both sides of this discussion. SO FRUSTRATING. I’ve played the despairing father role – when there just aren’t answers. it’s heartbreaking. So either Pohl blurts it out in the next strip, he just lowers his head and leaves with Agent Brown or he could slip them something that ends up leading them to Selkie’s birth home. Wait I just noticed him handing the prescription over. That bodes well for option 3. I’m betting on 3 myself. Todd: So there are other selkies out there! Pohl: Oh so that’s your name!!! 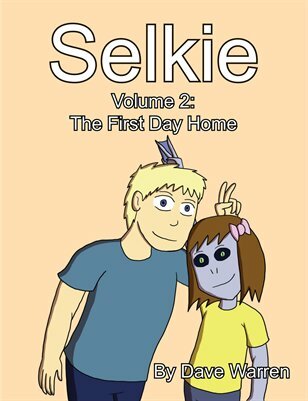 It’s nice to meet you Sel Kie. Here’s to hoping they can all be friends after this. The best outcome here is he hands over his card and say he cant tell him anything classified but he can be selkies physician to assist with questions about her development and any other medical problems that may arise. I think that smile indicates Agent Brown is playing a careful game here. He’s forbidden from revealing anything himself, but if the doctor “accidentally” reveals that information, he’s off the hook. So, he plays the bad cop to drive Todd to visible desperation, which in turn pushes Pohl to give in and reveal something. Very clever. and then pohl gets dragged away in handcuffs! everybody wins! Honestly, easiest way to handle this would be to get Todd a security clearance and read him into the project. He’s obviously, at bare minimum, understanding and accepting. He’s a professional with (to my knowledge) no serious criminal record, and let’s be straight…the government is putting Selkie (Nei Li) into a precarious mental situation by purposefully isolating her. The problem with letting Selkie know about her origins is that kids have trouble keeping secrets. She (And Amanda, and Heather) have already showcased how difficult it is for children to keep things to themselves. If Selkie knows, than every kid in school will also know by the end of the semester, and kids love to tell their parents about interesting things they’ve heard. If Todd has knowledge of her origins, but chooses not to tell her to ensure it remains secret, Selkie will start resenting him for not telling her instead of Agent Brown. This classified bull$h!1 is really the best possible arrangement to preserve Selkie’s anonymity, her respect for her father, and her well-being. If Todd took a moment to think, he would come to the same conclusion. I’m trying to convince myself that “She’s not human” is acceptable knowledge while “The name of her species is ___” has to remain under wraps. I guess it could make sense; the other kids at school already know she’s not human, but adults tend not to believe them; having a name for it might be an actual problem if it were to leak beyond her family. Or he wrote medicines that provide clues to Selkie’s biology! What in the WORLD is that face that Brown is making?! Also, the more I hear about this situation, the more it’s reminding me of residential schools – an ugly stain on Canada’s history, where Native American children where taken from their tribes to be assimilated into the settlers’ culture. They were isolated from their heritage and punished for seeking information on it, or if they were caught speaking their first language or practicing tribal rituals their parents taught them before they were taken away. Happily, Selkie’s adopted family wouldn’t go that route and in fact want her to learn about the culture she was born to as well as the culture in which she now lives. Unfortunately, offical policy seems to be going in the opposite direction. I’ve been reminded about that sort of thing too. This situation is just sending up flags all over the place. He looks especially green in the gill area. I’m guessing the line “I’m sorry, but I’ve already given you all the information I can” appears in the next episode. With any luck, Dr. Bunnyme just wrote his phone number down on that list. Why has Todd Smith (if that’s his real name) been wearing gloves in these indoor scenes?